A menu is a set of options. The user can select from a menu to perform a function, for example searching for information, saving information, editing information, or navigating to a screen. 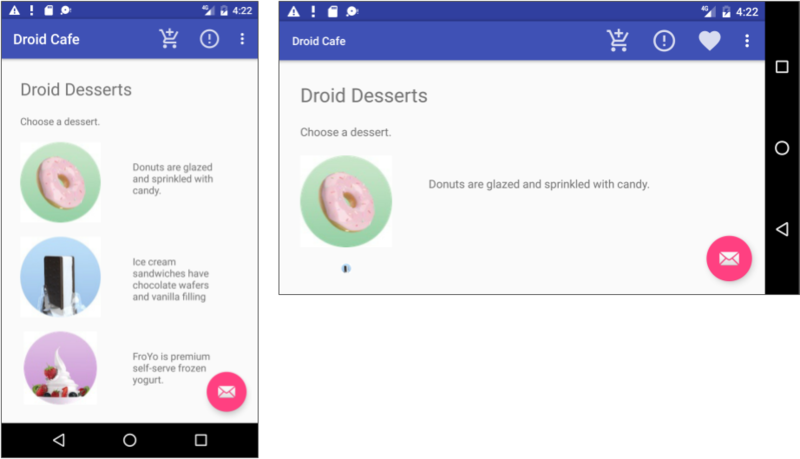 The figure below shows the types of menus that the Android system offers. Options menu: Appears in the app bar and provides the primary options that affect use of the app itself. Examples of menu options: Search to perform a search, Share to share a link, and Settings to navigate to a Settings Activity. Contextual menu: Appears as a floating list of choices when the user performs a long tap on an element on the screen. Examples of menu options: Edit to edit the element, Delete to delete it, and Share to share it over social media. Contextual action bar: Appears at the top of the screen overlaying the app bar, with action items that affect the selected element or elements. Examples of menu options: Edit, Share, and Delete for one or more selected elements. Popup menu: Appears anchored to a View such as an ImageButton, and provides an overflow of actions or the second part of a two-part command. Example of a popup menu: the Gmail app anchors a popup menu to the app bar for the message view with Reply, Reply All, and Forward. The app bar (also called the action bar) is a dedicated space at the top of each Activity screen. When you create an Activity from a template (such as Empty Template), an app bar is automatically included for the Activity. The app bar by default shows the app title, or the name defined in AndroidManifest.xml by the android:label attribute for the Activity. The app bar may also include the Up button for navigating up to the parent activity. Up navigation is described in the chapter on using the app bar for navigation. For example, your options menu might let the user navigate to another activity to place an order. Or your options menu might let the user change settings or profile information, or do other actions that have a global impact on the app. The options menu appears in the right corner of the app bar. The app bar is split into four functional areas that apply to most apps, as shown in the figure below. Navigation button or Up button: Use a navigation button in this space to open a navigation drawer, or use an Up button for navigating up through your app&apos;s screen hierarchy to the parent activity. Both are described in the next chapter. 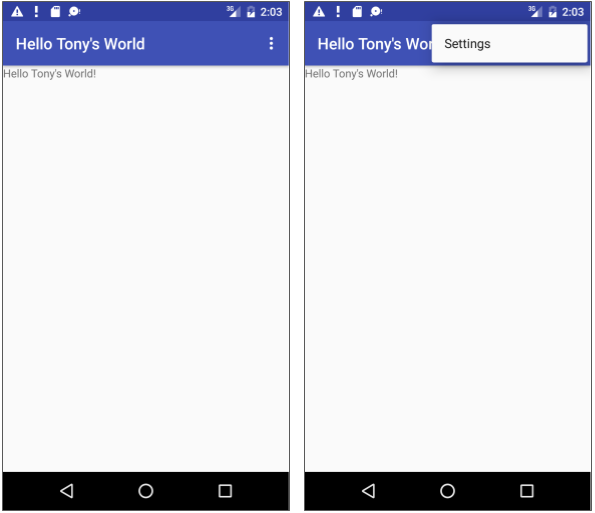 Title: The title in the app bar is the app title, or the name defined in AndroidManifest.xml by the android:label attribute for the activity. Action icons for the options menu: Each action icon appears in the app bar and represents one of the options menu&apos;s most frequently used items. Less frequently used options menu items appear in the overflow options menu. Overflow options menu: The overflow icon opens a popup with option menu items that are not shown as icons in the app bar. App bar. The app bar includes the app title, the options menu, and the overflow button. Options menu action icons. The first two options menu items appear as icons in the app bar. Overflow button. The overflow button (three vertical dots) opens a menu that shows more options menu items. Options overflow menu. After clicking the overflow button, more options menu items appear in the overflow menu. Each activity that uses the default theme also has an ActionBar as its app bar. Some themes also set up an ActionBar as an app bar by default. When you start an app from a template such as Empty Activity, an ActionBar appears as the app bar. Toolbar makes it easy to set up an app bar that works on a wide range of devices. Toolbar gives you room to customize your app bar later, as your app develops. Toolbar includes the most recent features, and it works for any device that can use the support library. To use Toolbar as an activity&apos;s app bar (instead of using the default ActionBar), you can start your project with the Basic Activity template. That template implements Toolbar for the activity, and it implements a rudimentary options menu with one item, Settings. Tip: If you use the Basic Activity template, you can skip the rest of this section, because the template provides everything you need. Add the support libraries appcompat and design. Use a NoActionBar theme and styles for the app bar and background. Add an AppBarLayout and a Toolbar to the layout. Add code to the Activity to set up the app bar. If you start an app project using the Basic Activity template, the template adds the following support libraries for you, so you can skip this step. Choose Tools > Android > SDK Manager to check whether the Android Support Repository is installed. If the repository is not installed, install it. Note: If necessary, update the version numbers for dependencies. If the version number you specified is lower than the currently available library version number, Android Studio warns you. Update the version number to the one Android Studio tells you to use. If you start an app project using the Basic Activity template, the template adds the theme to replace the ActionBar with a Toolbar, so you can skip this step. If you are not using the Basic Activity template, you can use the Toolbar class for the app bar by turning off the default ActionBar using a NoActionBar theme for the activity. Themes in Android are similar to styles, except that they are applied to an entire app or activity rather than to a specific view. When you create a new project in Android Studio, an app theme is automatically generated for you. For example, if you start an app project with the Empty Activity or Basic Activity template, the AppTheme theme is provided in styles.xml. To see this file, expand the res > values folder in the Project > Android pane. Tip: You learn more about themes in the chapter on drawables, styles, and themes. AppTheme "inherits"—takes on all the styles—from a parent theme called Theme.AppCompat.Light.DarkActionBar, which is a standard theme supplied with Android. However, you can override an inherited style with another style by adding the other style to styles.xml. If you start an app project using the Basic Activity template, the template adds the AppBarLayout and Toolbar for you, so you can skip this step. AppBarLayout also requires a separate content layout sibling for the content that scrolls underneath the app bar. You can add this sibling as a view group (such as RelativeLayout or LinearLayout) in the same layout file, or in a separate layout file. The above XML snippet uses an include layout to include the content layout in content_main.xml. This behavior is defined by the AppBarLayout.ScrollingViewBehavior class. Any View or view group that can scroll vertically to support nested scrolling for AppBarLayout siblings should use this behavior. If you start an app project using the Basic Activity template, the template adds the code needed to set up the app bar, so you can skip this step. The Activity now shows the app bar. By default, the app bar contains just the name of the app. 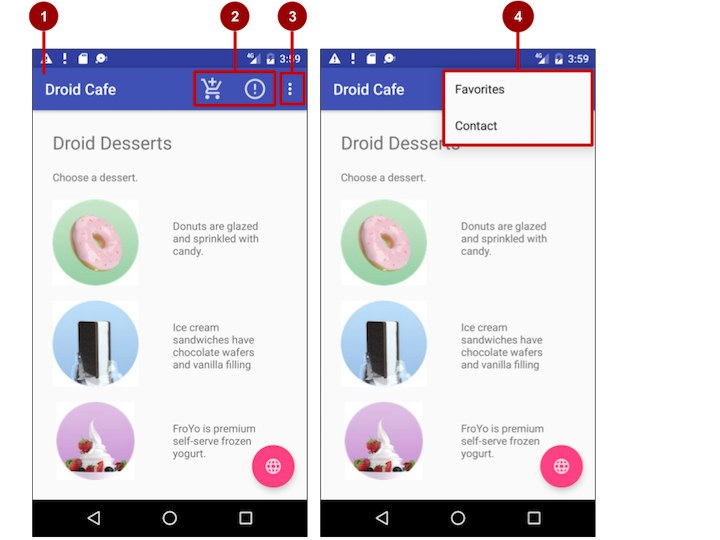 Android provides a standard XML format to define options menu items. Instead of building the menu in your Activity code, you can define the menu and all its items in an XML menu resource. A menu resource defines an application menu (options menu, context menu, or popup menu) that can be inflated with MenuInflater, which loads the resource as a Menu object in your Activity. If you start an app project using the Basic Activity template, the template adds the menu resource for you and inflates the options menu with MenuInflater, so you can skip this step and go right to "Defining how menu items appear". XML menu resource. Create an XML menu resource file for the menu items, and assign appearance and position attributes as described in the next section. Inflating the menu. Override the onCreateOptionsMenu() method in your Activity to inflate the menu. Handling menu-item clicks. 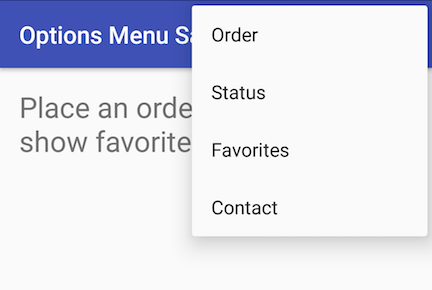 Menu items are View elements, so you can use the android:onClick attribute for each menu item. However, the onOptionsItemSelected() method can handle all the menu-item clicks in one place and determine which menu item the user clicked, which makes your code easier to understand. Performing actions. Create a method to perform an action for each options menu item. Select the res folder in the Project > Android pane and choose File > New > Android resource directory. Choose menu in the Resource type drop-down menu, and click OK. Select the new menu folder, and choose File > New > Menu resource file. Enter the name, such as menu_main, and click OK. The new menu_main.xml file now resides within the menu folder. Open menu_main.xml and click the Text tab to show the XML code. After setting up and inflating the XML resource in the Activity, the overflow icon in the app bar, when clicked, would show the options menu with just one option (Settings). If you start an app project using the Basic Activity template, the template adds the options menu with one option: Settings. Any item that you set to not appear in the app bar. Any item that can&apos;t fit in the app bar, given the display orientation. Whenever possible, show the most-used actions using icons in the app bar so that the user can tap these actions without having to first tap the overflow button. Expand res in the Project > Android pane, and right-click (or Command-click) drawable. Choose Action Bar and Tab Items in the drop-down menu. Edit the name of the icon (for example, ic_order_white for the Order menu item). Click the clip art image (the Android logo) to select a clip art image as the icon. A page of icons appears. Click the icon you want to use. (Optional) Choose HOLO_DARK from the Theme drop-down menu. This sets the icon to be white against a dark-colored (or black) background. Click Next. Click Finish in the Confirm Icon Path dialog. android:title: A string for the title of the menu item. android:titleCondensed: A string to use as a condensed title for situations in which the normal title is too long. Note: While the numbers 1, 2, 3, and 4 would work in the above example, the numbers 10, 20, 30, and 40 leave ample room for menu items to be added later, between these four items. "always": Always place this item in the app bar. Use this only if it&apos;s critical that the item appear in the app bar (such as a Search icon). If you set multiple items to always appear in the app bar, they might overlap something else in the app bar, such as the app title. "ifRoom": Only place this item in the app bar if there is room for it. If there is not enough room for all the items marked "ifRoom", the items with the lowest orderInCategory values are displayed in the app bar. The remaining items are displayed in the overflow menu. "never": Never place this item in the app bar. Instead, list the item in the app bar&apos;s overflow menu. 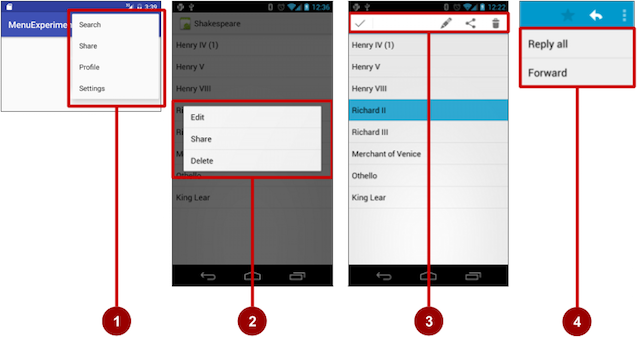 "withText": Also include the title text (defined by android:title) with the item. This attribute is used primarily to include the title with the icon in the app bar, because if the item appears in the overflow menu, the title text appears regardless. Options menu action icons. The first two menu items appear as action icons in the app bar: Order (the shopping cart icon) and Info (the "i" icon). Overflow button. Clicking the overflow button shows the overflow menu. Options overflow menu. The overflow menu shows more of the options menu: Favorites (the heart icon) and Contact. Favorites doesn&apos;t fit into the app bar in vertical orientation, but may appear in horizontal orientation on a smartphone, or in both orientations on a tablet, as shown below. If you start an app project using the Basic Activity template, the template adds the code for inflating the options menu with MenuInflater, so you can skip this step. If you are not using the Basic Activity template, inflate the menu resource in your activity by overriding the onCreateOptionsMenu() method and using the getMenuInflater() method of the Activity class. The resource id for an XML layout resource to load (R.menu.menu_main in the following example). The Menu to inflate into (menu in the following example). As with a Button, the android:onClick attribute defines a method to call when this menu item is clicked. You must declare the method in the Activity as public and accept a MenuItem as its only parameter, which indicates the item clicked. // The item parameter indicates which item was clicked. // ... Add code to handle the Favorites click. However, the onOptionsItemSelected() method can handle all the menu-item clicks in one place and determine which menu item the user clicked. This makes your code easier to understand. Use a contextual menu to allow users to take an action on a selected View. Contextual menus are most often used for items in a RecyclerView, GridView, or other view collection in which the user can perform direct actions on each item. A context menu, shown on the left side in the figure below, appears as a floating list of menu items when the user performs a long tap on a View. It is typically used to modify the View or use it in some fashion. 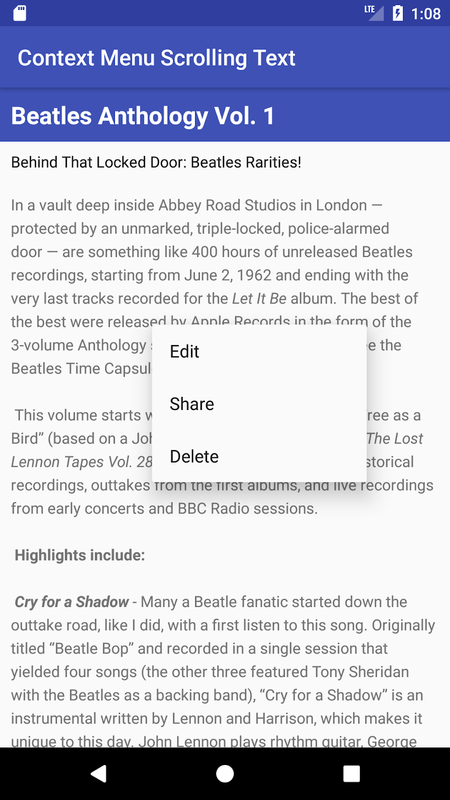 For example, a context menu might include Edit to edit the contents of a View, Delete to delete a View, and Share to share a View over social media. Users can perform a contextual action on one selected View at a time. A contextual action bar, shown on the right side of the figure below, appears at the top of the screen in place of the app bar or underneath the app bar, with action items that affect one or more selected View elements. Users can perform an action on multiple View elements at once, if your app allows it. The familiar resource-inflate design pattern is used to create a context menu, modified to include registering (associating) the context menu with a View. The pattern consists of the steps shown in the figure below. Create an XML menu resource file for the menu items. Assign appearance and position attributes as described in the previous section for the options menu. Register a View to the context menu using the registerForContextMenu() method of the Activity class. Implement the onCreateContextMenu() method in your Activity to inflate the menu. Implement the onContextItemSelected() method in your Activity to handle menu-item clicks. Create a method to perform an action for each context menu item. To create the XML menu resource directory and file, follow the steps in the previous section for the options menu. However, use a different name for the file, such as menu_context. Add the context menu items within <item ... /> tags. // Registering the context menu to the TextView of the article. Multiple views can be registered to the same context menu. If you want each item in a ListView or GridView to provide the same context menu, register all items for a context menu by passing the ListView or GridView to registerForContextMenu(). The onCreateContextMenu() method is where you define the menu items, usually by inflating a menu resource. The menu parameter for onCreateContextMenu() is the context menu to be built. The v parameter is the View registered for the context menu. The menuInfo parameter is extra information about the View registered for the context menu. This information varies depending on the class of the v parameter, which could be a RecyclerView or a GridView. If you are registering a RecyclerView or a GridView, you instantiate a ContextMenu.ContextMenuInfo object to provide information about the item selected, and pass it as menuInfo, such as the row id, position, or child View. The resource id for an XML layout resource to load. In the example above, the id is menu_context. The Menu to inflate into. In the example above, the Menu is menu. The above code snippet uses the getItemId() method to get the id for the selected menu item, and uses it in a switch case block to determine which action to take. The id is the android:id attribute assigned to the menu item in the XML menu resource file. 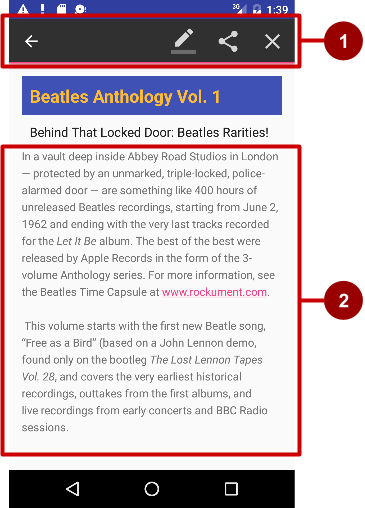 When the user performs a long-click on the article in the TextView, the floating context menu appears and the user can click a menu item. A contextual action bar appears at the top of the screen to present actions the user can perform on a View after long-clicking the View, as shown in the figure below. Contextual action bar. The bar offers three actions on the right side (Edit, Share, and Delete) and the Done button (left arrow icon) on the left side. View. View on which a long-click triggers the contextual action bar. The contextual action bar appears only when contextual action mode, a system implementation of ActionMode, occurs as a result of the user performing a long-click on one or more selected View elements. ActionMode represents UI mode for providing alternative interaction, replacing parts of the normal UI until finished. For example, text selection is implemented as an ActionMode, as are contextual actions that work on a selected item on the screen. Selecting a section of text or long-clicking a view triggers ActionMode. The user deselects all items. The user presses the Back button. The user taps Done (the left-arrow icon) on the left side of the action bar. When ActionMode is disabled, the contextual action bar disappears. Create an XML menu resource file for the menu items, and assign an icon to each one (as described in a previous section). Set the long-click listener using setOnLongClickListener() to the View that should trigger the contextual action bar. Call startActionMode() within the setOnLongClickListener() method when the user performs a long tap on the View. Implement the ActionMode.Callback interface to handle the ActionMode lifecycle. Include in this interface the action for responding to a menu-item click in the onActionItemClicked() callback method. The standard contextual action bar has a dark background. Use a light or white color for the icons. If you are using clip art icons, choose HOLO_DARK for the Theme drop-down menu when creating the new image asset. You will call startActionMode() to enable ActionMode, which returns the ActionMode created. By saving this in a member variable (mActionMode), you can make changes to the contextual action bar in response to other events. // ... The rest of the onCreate code. // Start ActionMode after long-click. Before you can add the code to onCreate() to start ActionMode, you must implement the ActionMode.Callback interface to manage the ActionMode lifecycle. In its callback methods, you can specify the actions for the contextual action bar, and respond to clicks on action items. // ... Code to create ActionMode. The onCreateActionMode() method inflates the menu using the same pattern used for a floating context menu. But this inflation occurs only when ActionMode is created, which is when the user performs a long-click. The MenuInflater class provides the inflate() method, which takes as a parameter the resource id for an XML layout resource to load (menu_context in the above example), and the Menu to inflate into (menu in the above example). The above code above uses the getItemId() method to get the id for the selected menu item, and uses it in a switch case block to determine which action to take. The id in each case statement is the android:id attribute assigned to the menu item in the XML menu resource file. The actions shown are the editNote() and shareNote() methods, which you create in the Activity. After the action is picked, you use the mode.finish() method to close the contextual action bar. return false; // Return false if nothing is done. The onPrepareActionMode() method shown above is called each time ActionMode occurs, and is always called after onCreateActionMode(). The onDestroyActionMode() method shown above is called when the user exits ActionMode by clicking Done in the contextual action bar, or clicking on a different view. You use startActionMode() to start ActionMode after the user performs a long-click. When the user performs a long-click, the call is made to startActionMode() using the ActionMode.Callback interface, and the contextual action bar appears at the top of the display. The setSelected() method changes the state of this View to selected (set to true). // Called when the user long-clicks on articleView. // Start the contextual action bar using the ActionMode.Callback. A PopupMenu is a vertical list of items anchored to a View. It appears below the anchor View if there is room, or above the View otherwise. A popup menu is typically used to provide an overflow of actions (similar to the overflow action icon for the options menu) or the second part of a two-part command. Use a popup menu for extended actions that relate to regions of content in your Activity. Unlike a context menu, a popup menu is anchored to a Button, is always available, and its actions generally do not affect the content of the View. For example, the Gmail app uses a popup menu anchored to the overflow icon in the app bar when showing an email message. The popup menu items Reply, Reply All, and Forward are related to the email message, but don&apos;t affect or act on the message. Actions in a popup menu should not directly affect the corresponding content (use a contextual menu to directly affect selected content). As shown below, a popup can be anchored to the overflow action button in the app bar. Create an XML menu resource file for the popup menu items, and assign appearance and position attributes (as described in a previous section). Add an ImageButton for the popup menu icon in the XML activity layout file. Assign onClickListener() to the ImageButton. Override the onClick() method to inflate the popup menu and register it with PopupMenu.OnMenuItemClickListener. Create a method to perform an action for each popup menu item. Create the XML menu resource directory and file by following the steps in a previous section. Use a suitable name for the file, such as menu_popup. Use an ImageButton in the Activity layout for the icon that triggers the popup menu. Popup menus are anchored to a View in the Activity, such as an ImageButton. The user clicks it to see the menu. // Create the instance of PopupMenu. // Inflate the Popup using XML file. // Register the popup with OnMenuItemClickListener. The method instantiates a PopupMenu object, which is popup in the example above. Then the method uses the MenuInflater class and its inflate() method. The resource id for an XML layout resource to load, which is menu_popup in the example above. The Menu to inflate into, which is popup.getMenu() in the example above. The code then registers the popup with the listener, PopupMenu.OnMenuItemClickListener. // Show the popup menu. A dialog is a window that appears on top of the display or fills the display, interrupting the flow of Activity. Dialogs inform users about a specific task and may contain critical information, require decisions, or involve multiple tasks. For example, an alert dialog might require the user to click Continue after reading it, or give the user a choice to agree with an action by clicking a positive button (such as OK or Accept), or to disagree by clicking a negative button (such as Cancel). You can also use a dialog to provide choices in the style of radio buttons, as shown on the right side of the figure below. The base class for all dialog components is a Dialog. There are several useful Dialog subclasses for alerting the user on a condition, showing status or progress, displaying information on a secondary device, or selecting or confirming a choice, as shown on the left side of the figure below. 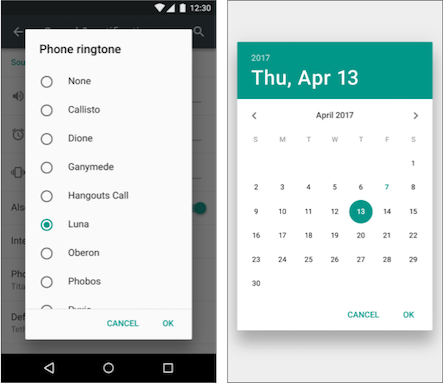 The Android SDK also provides ready-to-use dialog subclasses such as pickers for picking a time or a date, as shown on the right side of the figure below. Pickers allow users to enter information in a predetermined, consistent format that reduces the chance for input error. Dialogs always retain focus until dismissed or a required action has been taken. Tip: Best practices recommend using dialogs sparingly as they interrupt the user&apos;s workflow. 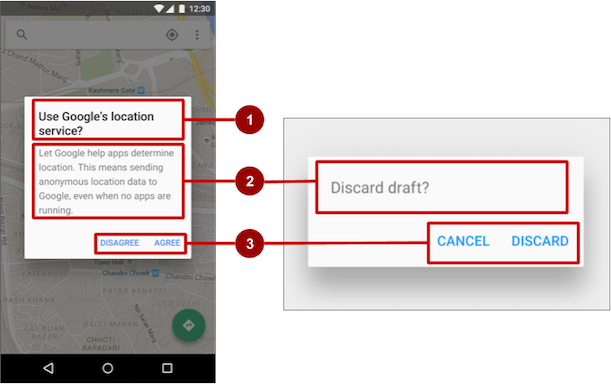 Read the Dialogs design guide for additional best design practices, and Dialogs in the Android developer documentation for code examples. AlertDialog: A dialog that can show a title, up to three buttons, a list of selectable items, or a custom layout. DatePickerDialog: A dialog with a predefined UI that lets the user select a date. TimePickerDialog: A dialog with a predefined UI that lets the user select a time. Alerts are urgent interruptions, requiring acknowledgement or action, that inform the user about a situation as it occurs, or an action before it occurs (as in discarding a draft). You can provide buttons in an alert to make a decision. For example, an alert dialog might require the user to click Continue after reading it, or give the user a choice to agree with an action by clicking a positive button (such as OK or Accept), or to disagree by clicking a negative button (such as Disagree or Cancel). Title: A title is optional. Most alerts don&apos;t need titles. If you can summarize a decision in a sentence or two by either asking a question (such as, "Discard draft?") or making a statement related to the action buttons (such as, "Click OK to continue"), don&apos;t bother with a title. Use a title if the situation is high-risk, such as the potential loss of connectivity or data, and the content area is occupied by a detailed message, a list, or custom layout. Content area: The content area can display a message, a list, or other custom layout. Action buttons: You should use no more than three action buttons in a dialog, and most have only two. The AlertDialog.Builder class uses the builder design pattern, which makes it easy to create an object from a class that has a lot of required and optional attributes and would therefore require a lot of parameters to build. Without this pattern, you would have to create constructors for combinations of required and optional attributes; with this pattern, the code is easier to read and maintain. For more information about the builder design pattern, see Builder pattern. Use AlertDialog.Builder to build a standard alert dialog, with setTitle() to set its title, setMessage() to set its message, and setPositiveButton() and setNegativeButton() to set its buttons. // User clicked OK button. // ... Action to take when OK is clicked. // User clicked the CANCEL button. // ... Action to take when CANCEL is clicked. You can add only one of each button type to an AlertDialog. For example, you can&apos;t have more than one "positive" button. Tip: You can also set a "neutral" button with setNeutralButton(). The neutral button appears between the positive and negative buttons. Use a neutral button, such as Remind me later, if you want the user to be able to dismiss the dialog and decide later. 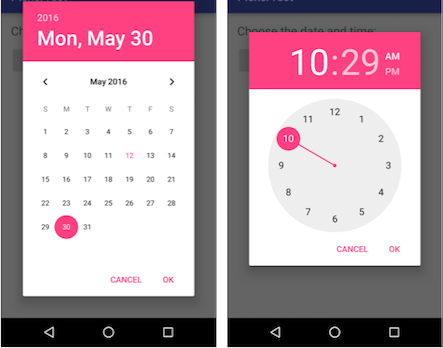 Android provides ready-to-use dialogs, called pickers, for picking a time or a date. Use them to ensure that your users pick a valid time or date that is formatted correctly and adjusted to the user&apos;s locale. Each picker provides controls for selecting each part of the time (hour, minute, AM/PM) or date (month, day, year). When showing a picker, you should use an instance of DialogFragment, a subclass of Fragment, which displays a dialog window floating on top of its Activity window. A Fragment is a behavior or a portion of a UI within an Activity. It&apos;s like a mini-Activity within the main Activity, with its own lifecycle. A Fragment receives its own input events, and you can add or remove it while the Activity is running. You might combine multiple Fragment elements in a single Activity to build a multiple-pane UI, or reuse a Fragment in more than one Activity. To learn about Fragment, see Fragments in the API Guide. One benefit of using a Fragment for a picker is that you can isolate the code sections for managing the date and the time for various locales that display date and time in different ways. You can also use DialogFragment to manage the dialog lifecycle. Tip: Another benefit of using fragments for the pickers is that you can implement different layout configurations, such as a basic dialog on handset-sized displays or an embedded part of a layout on large displays. Expand app > java > com.example.android... and select an Activity (such as MainActivity). Choose File > New > Fragment > Fragment (Blank), and name the Fragment (such as DatePickerFragment). Clear all three checkbox options so that you do not create a layout XML, do not include Fragment factory methods, and do not include interface callbacks. You don&apos;t need to create a layout for a standard picker. Click Finish to create the Fragment. In addition, a red bulb icon appears in the left margin after a few seconds. Click the red bulb icon and choose Implement methods from the popup menu. A dialog appears with onDateSet() already selected and the Insert @Override option selected. Click OK to create the empty onDateSet() method. This method will be called when the user sets the date. When you extend DialogFragment, you should override the onCreateDialog() callback method, rather than onCreateView. Replace the entire onCreateView() method with onCreateDialog() that returns Dialog, and annotate onCreateDialog() with @NonNull to indicate that the return value Dialog can&apos;t be null. Android Studio displays a red bulb next to the method because it doesn&apos;t return anything yet. You use your version of the callback method to initialize the year, month, and day for the date picker. For example, you can add the following code to onCreateDialog() to initialize the year, month, and day from Calendar, and return the dialog and these values to the Activity. As you enter Calendar.getInstance(), specify the import to be java.util.Calendar. // Use the current date as the default date in the picker. The Calendar class sets the default date as the current date—it converts between a specific instant in time and a set of calendar fields such as YEAR, MONTH, DAY_OF_MONTH, and HOUR. Calendar is locale-sensitive. The Calendar getInstance() method returns a Calendar whose fields are initialized with the current date and time. // Create a new instance of DatePickerDialog and return it. To show the picker, add a method to the Activity that creates an instance of FragmentManager using getSupportFragmentManager(). You can then use the method as the handler for the android:onClick attribute for a button or other input control. For more information about the Fragment class, see Fragments. String dateMessage = (month_string + "/"
// ... Code to do some action with dateMessage. The month integer returned by the date picker starts counting at 0 for January, so you need to add 1 to it to show months starting at 1. When you use the getActivity() method in a Fragment, the method returns the activity with which the fragment is associated. You need to do this because you can&apos;t call a method in the activity without the activity context—you would have to use an intent, as you learned in another lesson. The activity inherits the context, so you can use the activity as the context for calling the method, as in activity.processDatePickerResult. The Fragment should extend DialogFragment and implement TimePickerDialog.OnTimeSetListener. Use onCreateDialog() to initialize the time and return the dialog, as you did with the date picker. Create a method to instantiate the picker DialogFragment, as you did with the date picker. Create a method to process the result as you did with the date picker. Use onTimeSet() to get the time and pass it to the method to process the result. You can read all about setting up pickers in Pickers. 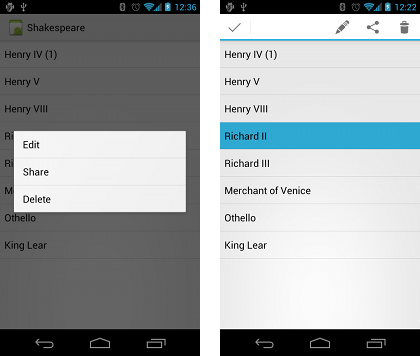 The related practical is 4.3: Menus and pickers.